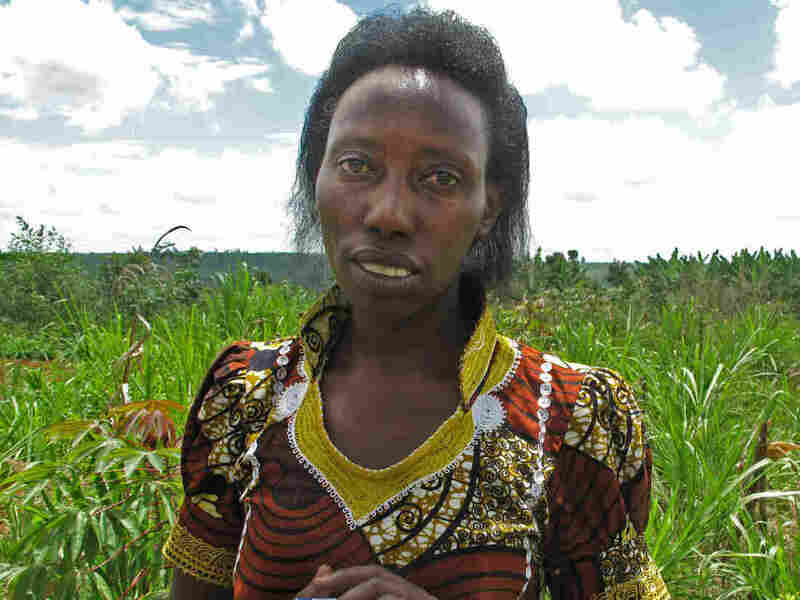 Remembering Rwandans Who Followed Their Conscience : Parallels "I would do it again and again and again," says one Hutu woman who defied orders and sheltered Tutsis during the 1994 genocide. Rwanda is beginning to recognize people who rescued those at risk. Olive Mukankusi lives in a two-room house with mud walls and a dirt floor in a village called Igati, in eastern Rwanda's Rwamagana province. To get there, you have to drive about 30 minutes down a dirt road. It's there, in her home, on a warm and sunny afternoon, that she tells a story that she's only told three times in 20 years: first to a local judge, then to an American genocide researcher — and now. 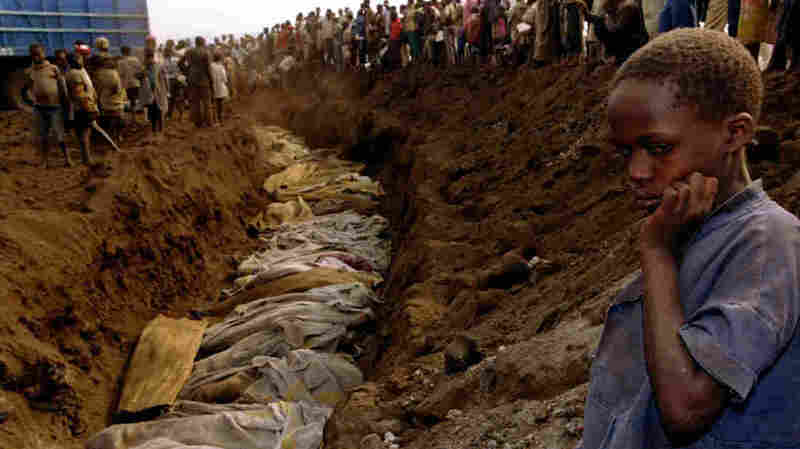 The story begins in April 1994, at the start of the genocide of Tutsis carried out by Hutu militias called Interhamwe. As she walked down a road of recently torched houses, Mukankusi, a Hutu, met two Tutsi girls, age 15 and 17. The girls had been her neighbors before she married and moved away. "They seemed to be confused, not knowing where to go," Mukakusi remembers. "They had a few things folded in their hands." The girls told her to go back home. And she told them: "Come with me." Mukankusi, now 42, knew the act of hiding Tutsis was punishable by death. But in that moment, it didn't matter. "I knew these girls. I saw how much pain they were in," she says. "I was ready to die with them, whatever would happen to me or my family." Mukankusi also brought another neighbor, a 55-year-old woman. She hid them behind her house, in a pit for making banana beer. Then her husband came home. "Of course I was a little bit worried that he might give them in, like most other men were doing," Mukankusi says. "But he saw that I had loved these people. If he betrayed these people, he would have betrayed me as well." The Rwandan genocide — three months of brutal ethnic violence that pitted majority Hutus against the minority Tutsis — proceeded quickly in some parts of the country, more slowly in others. In Mukankusi's village, the Hutu militias killed only men at first, saying they wished to save the women as future wives. But a couple of weeks later, they started killing women, too. A huge gang of militiamen came to her house and dragged out the two young girls and the older woman. (A neighbor had tipped them off.) They marched the four, including Mukankusi, to a killing site by the river. All might have been lost if not for a habit that Mukankusi had picked up. Lacking a bank account and worried about thieves, she kept all of her cash sewn up in the kanga fabric of her dress. That fateful April, she'd just sold her harvest, and had enough money to last her family the next six months. It was 20,000 francs — worth about $140 at the time. "When they saw the money, they were very happy," she says. "They didn't let me keep even some of it. They took it and forgot whatever was happening." They left — she now assumes, to hit the bars — and left the women behind. Four days later, the Tutsi army, led by the current president of Rwanda, arrived and chased off the Interhamwe militias. The soldiers rescued the Tutsis who had survived, including the girls that Mukankusi and her husband had protected. Then they put her husband in prison, where he would stay for the next 12 years. They said there wasn't yet evidence to distinguish killer from protector. At the office of the Aegis Trust in Kigali, Rwanda's capital, dozens of young Rwandans wearing headphones are transcribing the testimonies of survivors, perpetrators and rescuers. Deputy Director Yves Kamuronsi says that featuring the testimonies of these rescuers is more important today than ever. A Rwandan refugee girl stares at a mass grave where dozens of bodies were laid to rest in July 1994. 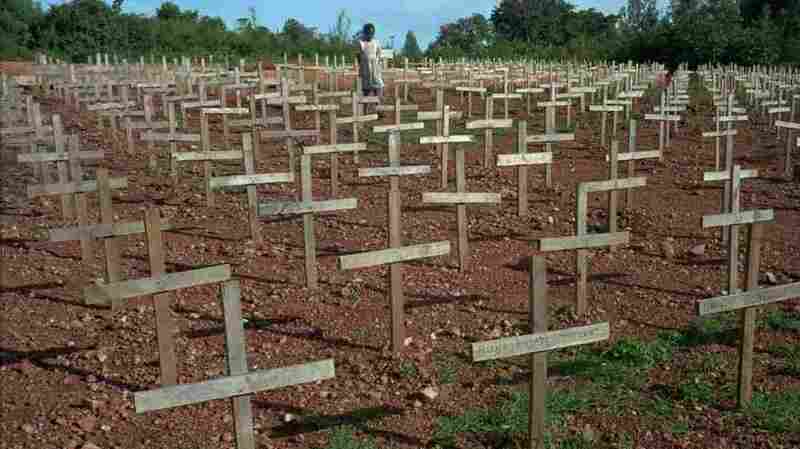 "It's now 20 years after genocide," Kamuronsi says. "And in every commemoration, every movie, we see stories of survivors, we see stories of perpetrators. We see less stories of rescuers." Those stories are particularly important, he says, for the more than half of the country's population born after the genocide, to see that not every Rwandan played their ethnically assigned role of killer or victim. Yet most of Rwanda's rescuers are not officially recognized. A government program to give rescuers an official "thank you" was put on hold after canvassing just 20 percent of the country and identifying fewer than 300 of them. In comparison, Yad Vashem — the Holocaust memorial and research center — was seeking out the stories of German rescuers, the "righteous among nations," by the 1950s — less than 10 years after the war. Godleaves Mukamunana is another rescuer from Igati village. She says she has been ostracized by some Hutu neighbors. "When they talk to me about rescuing, they ask me, 'Well, you rescued Tutsis, if something bad happened, do you think they would rescue you?'" Mukamunana says. "And I always tell them, 'Yes they would. I have no doubt about it.'" You're no longer one of us, those Hutus say. And rescuers haven't been embraced by all Tutsis either. While Olive Mukankusi's husband was in prison, a local Tutsi leader claimed part of her land. They're still fighting over it in court. And Godleaves Mukamunana says during the years her husband was in prison, her own children questioned her deed. "They would ask me, 'If you hid people at home, why is it they decided to take daddy?'" she recalls. "I told them, 'You don't have to worry, because the act we did, God is going to reward us, the right way.'" In 2007, Mukankusi and Mukamunana got the chance to tell their stories, for the first time, in local courts called gacaca. Neighbors confirmed the stories and their husbands were quickly released. Today, the family is making up for that lost decade of earnings. Mukamunana would like to send her bright, middle daughter to college, but she's coming to realize she'll never afford it. 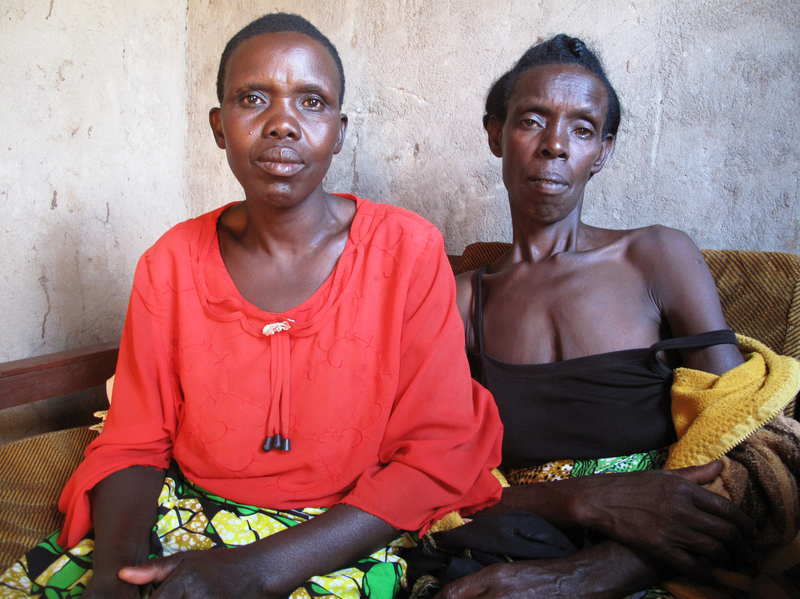 Godleaves Mukamunana, left, hid Domitil Mukakumuranga, in her house for weeks so that Hutu militias wouldn't kill her. "Seeing her alive is the best thing," Mukamunana says. "That kind of relationship we have is priceless. The fact that I don't have more like her -- those who were killed — that's what's hurting." After all that — as her daughter asked her before — does she have second thoughts? Had she and her family fled earlier, instead of staying to help her Tutsi neighbors, her husband might not have been rounded up and arrested. He might have avoided those 12 years in jail. "That cannot stop me from doing it again!" she says emphatically. "Actually, I'd do it double. I'd do it again and again and again. Because now I see the outcome. I can talk with anyone, with no problem." Her reward, she says, is her clear conscience.